Do you have what it takes to get in the boat? Join a dedicated marine search and rescue team! Being an active search and rescue crew member is an exciting, challenging and rewarding role but is not for everyone. You will be paged in the middle of the night and respond to emergencies in weather and sea conditions that most mariners avoid. You will be called on to navigate in fog and darkness, operate a rescue vessel in wind and waves, safely handle tow lines and other gear, use your first aid skills, follow orders, and give orders. In other words you need to be skilled, brave, and tough.You will work in a dangerous environment. You will be coming to the aid of people who are frightened, confused, or injured. Some missions involve tragedy and death. But if you have the character and commitment, we will give you all the tools, training and support you need to succeed as a search and rescue crew member. The men and women who take on this task say the rewards of saving a life on the water are beyond measure. Available to be on call and remain near a rescue vessel as part of a rotation schedule. Acquire the necessary certifications for your crew level. Support the larger RCM-SAR team across the region. Be committed to excellence in search and rescue service to the public. A team of men and women who will support your training goals and membership needs. RCM-SAR’s own comprehensive training program, including the Coxswain Leadership stream in our own fast rescue craft simulator. The latest personal safety equipment. The opportunity to work with other dedicated search and rescue crew members. The opportunity to crew on sophisticated search and rescue fast response vessels. Committed to educating the public about boating safety. Available to promote boating safety at public events, local marinas, and on the water. Provide your energy and expertise in promoting boating safety. Educational materials and equipment to help you promote your boating safety message. 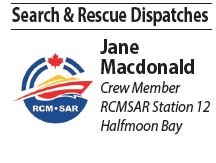 Willing to offer your time and skills to support your local RCM-SAR Station and its finances. Help your local rescue station with shore-based activities that support the safety of the search and rescue crews and maintain the readiness of the station to respond to emergencies. A rewarding volunteer environment and an enthusiastic and supportive team dedicated to saving lives on the water. As members of the Search and Rescue Community, our hearts go out to the families of the young adults who tragically lost their lives at Shannon Falls near Squamish this past week. The volunteer teams from Squamish Search and Rescue, Squamish fire and the RCMP who attempted the rescue, and ultimately performed the recovery, are equally in our thoughts. Closer to home, our own Sunshine Coast Search and Rescue team worked alongside first responders to assist at the tragic plane crash in Selma Park. Our deeply felt sympathy and support goes out to the family and loved ones of those involved. As we learn at Search and Rescue on a regular basis, accidents are by nature unpredictable. With the excitement that the outset of summer brings, may we remember as well to make every preparation, and take every precaution possible. As we are forced to learn, each year it seems, accidents happen so very quickly. It is for this reason that we prepare, plan and inform friends of our intended path before we take to the ocean, lakes and mountains of our beautiful coast. As survivors, we owe it to the fallen to maintain a vigilant and compassionate watch over one another. It will surprise few that the vast majority of water related fatalities occur during the summer months; incidents of drowning occur most commonly when British Columbians are swimming, fishing or power-boating. The Community Against Preventable Injuries is partnering on a safe boating campaign with Transport Canada, the BC Injury Research and Prevention Unit and the Royal Canadian Marine Search and Rescue (RCMSAR), in an effort to significantly reduce the number of serious preventable injuries – including drowning – by challenging the notion that injuries just “happen” but they “won’t happen to me”. • Wear a Personal Flotation Device/Lifejacket: No one “expects” to fall overboard – hence the vast majority of boaters who drowned in 2016 were not wearing a lifejacket or were wearing it incorrectly. • Alcohol consumption: Drinking and boating don’t mix – over 40 per cent of victims had consumed alcohol prior to the incident. • Have the right equipment: Make sure it is in good working condition and accessible, and know how to use it. The safe boating campaign is part of a three-year project. To learn more about preventable injuries, visit www.preventable.ca. To learn more about RCMSAR, visit www.rcmsar.com. 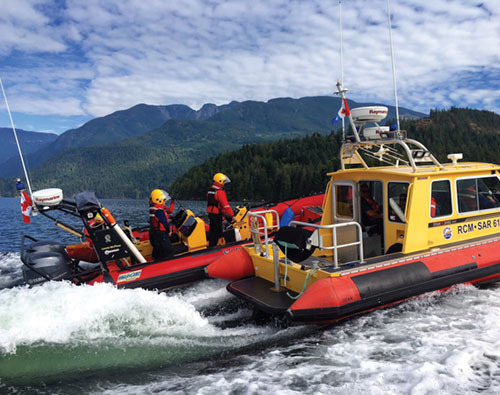 From Gibsons to Pender Harbour, four distinct Search and Rescue units comprised of 120 active crew members and over 50 supporting volunteers stand guard over the trails and shoreline, ocean and inlets of the Sunshine Coast. Well trained, and well prepared for a wide range of emergency situations, these volunteer crews act as an outdoor adventurer’s last hope, when the best-laid plans go awry. To be prepared for any event, each unit raises funds for meeting spaces, gear, training courses, emergency equipment as well as rescue vehicles and vessels to fulfill rescue duties. Contributions from generous community members and grants from local foundations, government and service agencies allow volunteers to focus on skill development and proficiency. Sunshine Coast Search and Rescue volunteers actively train and anticipate events that may entrap, trip or trick the unsuspecting trail or water enthusiast. The month of February saw crew members refreshing their first aid skills, testing gear, pursuing safety certifications and practicing effective communications with other Coast resources. Ground and marine crews met in both indoor and outdoor classrooms to practice advanced search skills and to review crew communication and tasking drills. For marine preparedness, crew members from Station 14 (Gibsons), Station 12 (Halfmoon Bay) and Station 61 (Pender Harbour) have been busy with first responder first aid certification, emergency operations essentials with Sunshine Coast Regional District, navigation, local area familiarity as well as radar and chart plotter electronic tool literacy. New recruits have been on several check rides and are joining active crew on call rotations. An impressive on-water training rendezvous was facilitated in February with three of the four RCMSAR vessels on the Sunshine Coast. Two crews from Station 12 and one from Station 61 mustered near Earls Cove ferry terminal where towing, pacing, boarding, first aid scenarios and search pattern exercises were practiced. 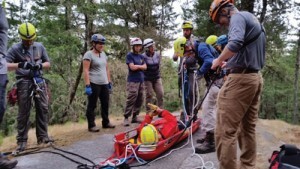 Developing skills and readiness, cross-Coast emergency response connections, crew familiarity and local area knowledge are top priorities for all Search and Rescue volunteers. On behalf of all four Coast crews, we thank you for your support, and wish you safe, and uneventful enjoyment of our great outdoors this spring. On behalf of Royal Canadian Marine Search and Rescue Stations 12, 14 & 61, and our partners in safety and preparation, Sunshine Coast (Land) Search and Rescue, we extend the very best wishes of the season to all of our friends, generous donors and fellow outdoor adventurers. We also extend a gracious thank you to the Local for sharing our dispatches so generously throughout the year. With winter upon us, our teams have been busy doing fog and foul-weather training on land and sea, with new recruits joining our crews and preparing for new challenges. Sunshine Coast (Land) Search and Rescue recently hosted a year-end dinner and recognition night. Members were recognized for their long-term volunteer commitment to search and rescue including the annual Top Pick award. Members also recently volunteered their time to help out the Elves Club in their annual drive. SCSAR member Sue Duxbury is now trained to present “Adventure Smart”, a suite of five national prevention programs focused on reaching Canadians, and visitors to Canada, who participate in outdoor recreational activities. All programs are free. Station 61 has officially kicked off its fundraising campaign with the intent to purchase a type 11 vessel. Pender Harbour’s Rotary group has generously donated to the cause and a community education campaign was held at the John Henry’s Christmas Market.This summer’s group of new RCM SAR recruits have been training tirelessly and many have completed their Radio Operators Certificate Marine course, first aid and even RHIOT school for advanced crew in Bamfield. All Stations have extremely enthusiastic and dedicated new recruits well on their way to becoming leaders in each station. We are pleased and honored by their level of commitment to our station and our SAR mandate. Station 14 (Gibsons) participated in a multi-unit coordinated search for a missing boater and his vessel (eventually located in the Strait) and recently assisted and towed a disabled sailboat off Bonniebrook. Join us for January 1st Polar Bear Swim at Armours Beach at 11am or at Davis Bay with the Lions Club & Station 12 (Halfmoon Bay). All members of the Coast are invited to enjoy hot chocolate, certificates for swimmers and prizes for best costume. ‘Tis the season of making lists, and checking them twice, and if ever there was a call to action that your SAR teams believe in, that is it. As you plan your hiking, sledding, snowshoeing, back country skiing or boating this winter, please remember to make a route plan, share it with a friend or relative, and check your gear twice before heading out to enjoy our magnificent coast and coastal mountains. Play safe, and the very best of the season to all. Helping save lives on the water! The smell of outboard fills the air as the 2017 boating season begins. Station 12’s members want to remind you to check your safety gear for out of date items. Such as dead batteries, replenishment needs or refills etc. Make sure you have a life jacket or PFD for every person on board. Enough fuel to get to your destination and back (with some in reserve) is always a great idea. Look for us on the water to receive your free Vessel Safety Survey and safety kit. Or contact info@rcmsar12.org if you would like to book a full Pleasure Craft Safety Check. A VHF radio is a great addition to your boating experience. With today’s models being smaller and less expensive they are easy for anyone to carry. If you are having an emergency on the water use channel 16 on the VHF, or dial *16 on your mobile. Sunshine Coast Search and Rescue volunteers actively ‘stand on guard for thee’. The month of February saw crew members snowshoeing, practicing rope rescue techniques, swimming, testing gear, heaving throw lines, refreshing First Aid skills and learning how to respond to potential overdose situations. Ground and marine crews met in both indoor and outdoor classrooms to practice necessary search skills and to review effective crew communication and tasking drills. Keeping our land and waters ‘glorious and (event) free’ is a calling heeded by our local volunteers who willingly step into situations where many fear to tread. On land, Sunshine Coast Search and Rescue was tasked in an urban setting and assisted RCMP in locating a missing male in the Gibsons area. SAR crew practiced several rescue drills on Dakota Ridge, employing local area navigation with the help of our dedicated search team volunteers and two of our greatest tools of the trade—UTV (Utility Task Vehicle) and Echo, our very own Sunshine Coast Search and Rescue canine. The unit is planning to renovate its meeting and secure storage space at John Hind-Smith Hall on Solar Road in Wilson Creek. Also this month, the SCSAR crew honours the retirement of a respected search manager, Jim Janke, who will be greatly missed. For marine preparedness, crew members from Station 14 (Gibsons), Station 12 (Halfmoon Bay) and Station 61 (Pender Harbour) have been busy with Critical Incident Stress recognition and management training, First Responder first aid certification and Emergency Operations Essentials with Sunshine Coast Regional District. New recruits have been on several check rides and are joining active crew on call rotations. These challenging days of snow and icy winter are no match for the spirit and energy of Search and Rescue volunteers, who continue to spend their time upgrading personal skills and technical knowledge. For these teams, a life-affirming antidote to cabin fever and media overload is found in the active application of compassion, teamwork and service to one’s local community. Local SAR volunteers, across land and sea, are bound by a personal commitment to community service and a love of the Sunshine Coast’s natural beauty and marine wonders. SAR teams continue to practice for all weather conditions. A day-long practice session was held at Dakota Ridge on Jan. 8 during which snowmobile, snowshoes and the UTV were all put to the test. The unit’s search dog and rope rescue team also took the opportunity to work in the deep snow. On the community front, one of our SAR members made a presentation on what we do to the local Pathfinders group at their “Be Prepared” Camp at Sarah Wray Hall in Irvine’s Landing on Jan. 22. SAR continues to hone its map and compass skills with indoor classroom learning complemented by outside practical skills – in the dark. On the waterfront, Royal Canadian Marine Search and Rescue volunteers work on refining their understanding of Aides to Navigation, Collision Regulations and First Aid practice and drills. At the end of February, members of Station 12 will be hitting the pool at the Sechelt Aquatic Centre to ensure everyone is comfortable in their gear and in multiple water-based scenarios. Winter’s long nights provide time for reflection on the importance of training and preparedness, ensuring the safety of our crew and vessels. On March 2, British Columbia’s Search and Rescue volunteers will unveil a memorial to our fallen at the grounds of the BC Legislative Buildings. It is with great and enduring sorrow that we recognize the names of two RCMSAR Station 12 members who will be inscribed on the memorial: Angie Nemeth and Beatrice Sorensen. Proud team members whose contribution and commitment will never be forgotten. The monument will be located near similar memorials for BC’s police, fire and ambulance personnel. It will honour marine, air and ground SAR volunteers who gave their lives in the line of duty and serve as a permanent reminder of the contribution of SAR.